EpiPen is an injection that contains epinephrine, a chemical that narrows blood vessels and opens airways in the lungs. EpiPens have become a necessity for families with children suffering from severe allergies to counter effects like wheezing, uneven breathing, increased or decreased heart rate, swelling and other potentially fatal reactions. 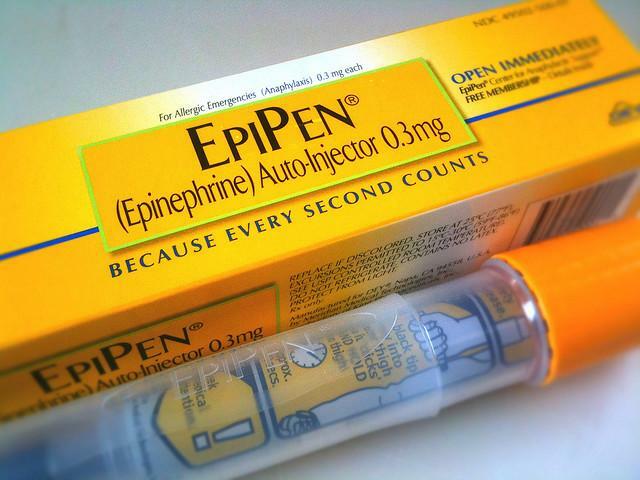 The allergic reactions (anaphylaxis) treated with the use of EpiPen include those from insect stings or bites, food, drugs, and other allergens. These are also used to treat exercise-induced anaphylaxis. EpiPen auto-injectors are prescribed to people who have a history or recognized risk of going into anaphylactic shock due to a severe allergy. The effects of this medication are rapid but not long-lasting so it is advised to immediately seek medical attention. Recently, the prices of EpiPen went up, raising concerns for allergy sufferers. Mylan — the manufacturer of EpiPen — acquired the decades-old product in 2007, when pharmacies paid less than $100 for a two-pen set. In 2009, a pharmacy paid $103.50 for a set and by July 2013 the price increased to $264.50. Later in May 2015, the price rose to $461 and spiked to $608.61 this May, data provided by Elsevier Clinical Solutions’ Gold Standard Drug Database revealed. Both EpiPen and EpiPen Jr auto-injectors contain active ingredient adrenaline, which is a hormone produced naturally by the body that is usually released by the adrenal glands in times of stress. This helps the body to deal with life-threatening situations by preparing the body. Adrenaline, which is also sometimes called epinephrine, is released through the injection to treat fatal allergic reaction called anaphylactic shock. The injection rapidly controls the symptoms of an active allergic reaction, which includes wheezing, difficulty breathing or swallowing, fall in blood pressure causing dizziness or faintness, feeling sick, vomiting, fast heartbeat, weak pulse, tightening of the chest, itching of the skin, among several others. The reactions are reversed as the injection acts on alpha and beta adrenergic receptors in the body. While alpha receptors are found on the walls of blood vessels, beta receptors are found in the heart and lungs. Who should be careful before using EpiPen?